Whenever we used to travel around India, my dad used to rent a car or a van with a hired driver. We used to travel with a few of our relatives and we would all fit ourselves in 2 cars. It you can tolerate the traffic on Indian 2 lane highways (one lane in each direction) going at 90-100 miles per hour, I don’t think you will ever need to go to Disneyland! That is how crazy the driving there is. So there was this one incident where the driver was going at a speed of 90 miles an hour. There was a car in front of our car and a bus in front of the other car. There was a truck approaching from the opposite direction. I was sitting in the front seat watching and recording on video all this for posterity in case we die! Our driver decided to overtake the car and bus that was about to overtake the bus. The truck from the opposite direction was approaching fast and we had to overtake the bus and the car that was overtaking the bus. My wife, who is not Indian and was on her first trip to India was sitting at the back sweating looking at the unfolding drama. She was telling my parents to tell the driver to slow down and my parents consoled her by saying to look out the side window! She was hysterical. While this was going on, the driver had successfully overtaken the bus and the car and just made it in the nick of time before the truck from the opposite end approached us. Whew! That was a really really close one. After all this excitement, we were really hungry. In India, there are lot of the small “hole in the wall” restaurants that serve food to truckers and other traveler called Dhabas. They have an open kitchen where food is cooked on wood fired stoves and made fresh and it tastes awesome. Just looking at the food made me want to stop and eat. But since living in the USA for so long, I have lost my immunity where I could not just eat anything. Besides, my wife was with me and I did not want her to get Delhi belly. What the heck is Delhi belly? You usually get that if you do not eat at a proper restaurant (definitely not Dhabas) and drink unfiltered water and your stomach goes out of whack where your get sick and diarrhea. It is not a pleasant feeling at all. Anyway, when I used to live in India, I used to eat food at the various roadside Dhabas that cooked really tasty dals, veggie curries and naans cooked in the tandoor clay ovens. The food there is so good, it is hard to resist eating it, Delhi belly notwithstanding. That brought back memories and hence the reason for recreating the chana masala dal. I think it came out quite well. Please let me know what you think. 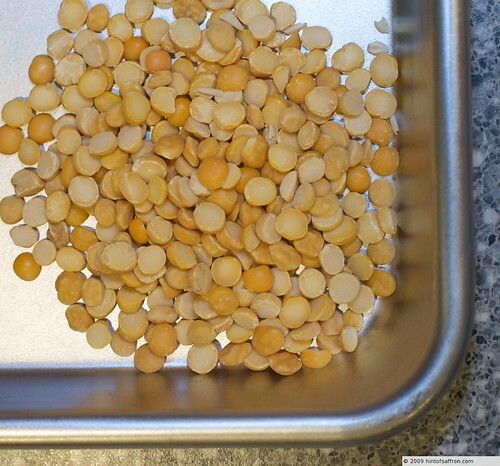 Soak the chana dal for at least 6-8 hours in 4 cups of water. 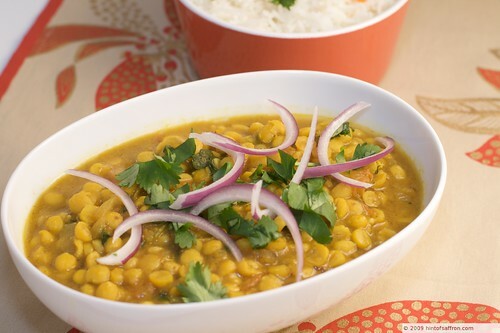 When ready to cook the dal, boil the dal in a medium saucepan with 3 1/2 cups of fresh water on medium-high heat, then reduce the heat and let it simmer on slow boil for approximately 30 minutes. Check for doneness by crushing 1 dal between your fingers. If it is soft, then dal is ready. This step can be done in advance if you prefer. In a saute pan, heat 3 tablespoons of ghee on medium heat.Add cumin seeds and let it sizzle. Add the onions and cook till they are browned. Add the dry red whole and cook till slightly dark. Add grated ginger and garlic and fry for a 30 seconds. Add the chopped tomatoes, coriander powder, red chili powder and turmeric powder. Fry for 2-3 minutes or until the tomatoes are well cooked. Add the garam masala and fry for another 30 seconds or so. Once done, add the fried masala cooked above to the pan containing the boiled dal. Make sure to get all the masala from the saute pan. Add the cilantro and stir. Eat with either hot Indian basmati rice or Naan.